Mangore | Bellucci Guitars - Elvis Presley, "Can't Help Falling in Love"
Elvis Presley is a world symbol for stardom and the most amazing artistry. He stands for a whole generation and notwithstanding the fact that he only lived a very short life, he left a mark and an impression on the people of his time and on the many generations to come. Some of his songs are truly epic and "Can't Help Falling in Love" from the 1961 movie "Blue Hawaii" is one of those. The piece revolves around a linear arpeggio in C and it fits the classical guitar to perfection. When the melody is superposed to the C major arpeggio, the listener is taken on a trip into memory lane and love. The piece fits the classical guitar perfectly and the recurring arpeggio sequence generates some quite stunning harmonic convergences. 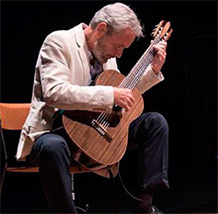 The piece is literally tailored for the classical guitar.In order to master the piece you will have to master 2 techniques: Bringing out notes in arpeggios through fijación and avoiding string squeaks when lifting the fingers off the fingerboard. The arpeggio moves solemn and peaceful and the marvelous melody stands out gently on top. Bring out the sound of the a finger by stiffening the joints in the a finger (fijación). The colored Red and Yellow strings are the 2 strings where the melody must be carried and you achieve it by stiffening the a finger through fijación.